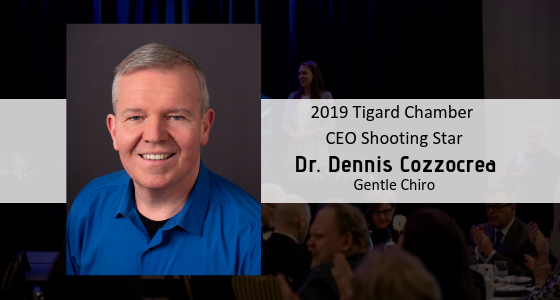 Dr. Dennis Cozzocrea, Owner of Gentle Chiro, has been named the 2019 Tigard Chamber CEO Shooting Star. This award is given to recognize a member’s significant achievement in the launch/implementation of a new program/organization or taking a program to the next level within the Tigard Chamber which has greatly benefited the chambers brand, its members and its visibility. Dennis has been a chamber member for 3 years. Shortly after joining the Tigard Chamber he came to the chamber CEO with the idea of a health care expo and a specialty networking group. At that time, staff did not have the bandwidth to develop launch and sustain another new program. Dennis was told, great idea, but we really need a member to step up and make this happen. He did hold that health care expo in his location, but kept that vision of a specialty networking group alive for two years. Dennis’ idea was to create a focused networking group of health and wellness professionals, with the vision that it could bolster membership, include a health fair/expo and create a place for referrals and education within the health and wellness industry. Dennis worked with chamber staff to make this a reality and in April 2018 the Health Care Affinity Group (HCAG) was born. This group, led by Dennis meets monthly and provides tremendous value for health and wellness professionals in a more intimate setting than our weekly a.m. networking. Additionally this group is focused on a specific set of industries which complement versus compete with one another. Over the last year we have seen numerous businesses join the Tigard Chamber to be part of this members only affinity group and it has added additional value to our members in the health and wellness professions. The group also had a health care expo in conjunction with our local Tigard Farmers market and there are plans for a bigger event with the Tigard Farmers Market this coming season. This award recognizes Dennis for developing, launching and sustaining the Tigard Chamber Health Care Affinity Group over the last year. It has had a positive impact on the Tigard Chamber brand, its members and its exposure within the health and wellness community. We look forward to the continued contributions of the HCAG and want to thank Dennis for his leadership of this monthly specialty networking group. Engaged members, investing in the chamber and stepping up and out to help add programs enables the Tigard Chamber to continue to offer more and broader value to our members than we could with just staff resources. Members helping each other, creates a culture where others want to join and participate as they all build business and grow together. Please join us in congratulating Dennis on this well-deserved award. His award will be formally presented with other Tigard volunteer and business awards at Tigard’s 2019 Shining Stars Community Awards Celebration, being held on Friday, May 3rd, 2019 from 5:30-9 p.m. at Embassy Suites – Washington Square, event location host. With a theme of “Travel the World”, this elegant themed dinner event includes dinner, silent auction, dessert dash, awards, and more. Tickets are only $60/person. So dress your best and come join us to celebrate Tigard!